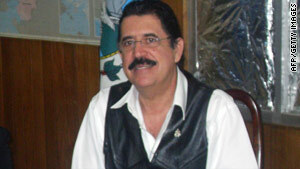 Manuel Zelaya has remained in the Brazilian embassy in Honduras since he returned from his ouster. (CNN) -- Ousted Honduran President Manuel Zelaya has received an offer from the Dominican Republic to engage in reconciliatory talks next week with his elected successor. However, officials within the de facto Honduran government say it's unlikely that Zelaya, who has been holed up in the Brazilian embassy in Tegucigalpa since September, will be able to make the trip to meet elected President Porfirio "Pepe" Lobo. "Unless he leaves on a flying saucer, Zelaya is not going anywhere," a source from within Honduras' interim government -- who asked not to be identified because of the sensitivity of the situation -- told CNN. "The only legal way for him to leave the country is under the condition of political asylum." Zelaya has said he is still the legitimate president of Honduras, and as such, would not ask for, or accept political asylum. He has said that if he leaves Honduras for another country, it would have to be as a "guest." Zelaya's assistant said Friday that Zelaya is thankful for Dominican President Leonel Fernandez's meeting offer, but declined to comment further. Zelaya was ousted in a June 28 coup. After spending months in exile, Zelaya snuck back into Honduras in September and has not left the Brazilian embassy. His return was an effort to restart talks to negotiate his return as president, but that never happened. CNN's Maria Elisa Callejas and Willie Lora contributed to this report.